As president and co-founder of Miami-based real estate development firm Terra Group, David Martin directs some of South Florida’s leading real estate developments with an emphasis on neighborhood-building, design and resiliency. He has enlisted some of the world’s top architects to design his projects. Examples include the Bjarke Ingels-designed Grove at Grand Bay and the Rem Koolhaas/OMA-designed Park Grove—two new luxury residential towers that are leading the revitalization of Coconut Grove. Eighty Seven Park, Terra’s newest residential project, now underway in Miami Beach’s North Beach community, will be a 70-unit beachfront condominium designed by Pritzker Prize-winning architect Renzo Piano. In Weston, Botaniko, is a 121-acre master-planned residential community designed by Chad Oppenheim and Roney Mateu. Terra’s mixed-use projects underway across South Florida include the Mary Street office and retail complex in Coconut Grove and the 47-acre Pines City Center retail and multifamily development in Pembroke Pines. 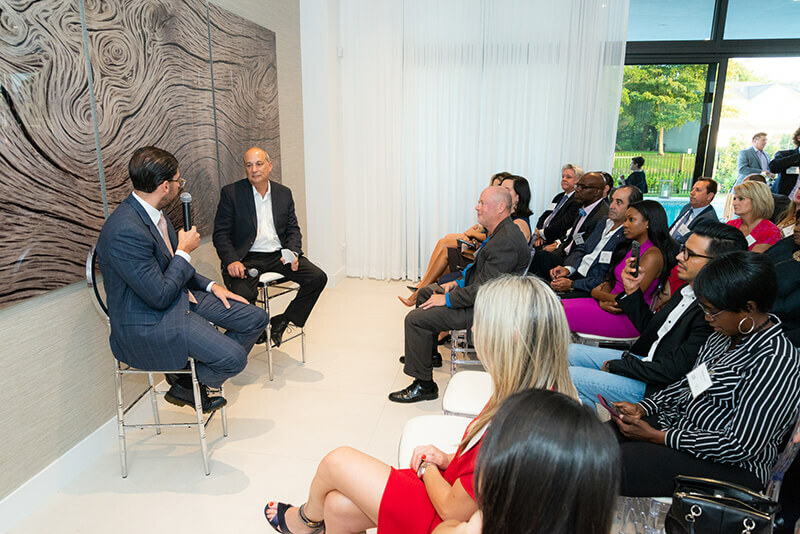 A native Miamian, he has taken a proactive role in efforts to study and combat the effects of climate change, including participating in the city of Miami’s Sea Level Rise Committee, speaking on the topic at real estate and urban planning conferences, and serving as a Forbes contributor, covering resiliency. His commitment to community is underscored by Terra’s role in charitable, civic, arts and cultural organizations, including the Miami Children’s Health Foundation, Vizcaya Museums and Gardens and the Wolfsonian-FIU museum, library and research center. For this installment of “CEO Connect,” SFBW President and Chairman Gary Press interviewed Martin at Botaniko. This interview has been edited for brevity and clarity. Tell me a little bit about your childhood, and what your mom and dad did. I was born in Gainesville. My father was going to law school at the University of Florida. Both my parents are Cuban. My mom’s family had opened a chain of funeral homes in Dade County. I grew up in the funeral business as a kid, which was interesting. Then my father [and] my grandfather on my dad’s side were in the tobacco business, so that was interesting as well. I always had an entrepreneurial bug. I grew up in Coral Gables, went back to Gainesville and got my law degree, my MBA. I opened a coffee shop over there. … I always knew I wanted to build and create things for people to have experiences. This coffee shop was interesting, because it’s how I got into real estate. I started building it without a permit, so I got a court order from the city and I had to go to the city of Gainesville and deal with all the different departments. Then we completed it. I ended up selling the coffee shop and it was my first deal. And then in 2001, I decided to start doing deals. My dad was one of the first attorneys at Greenberg Traurig in the ’70s. And so I opened up a little co-working space in the same office building as Greenberg and I started the company, buying deals, and here we are. What’s going to happen with real estate in five or 10 years? What’s the potential impact of Uber, Lyft and self-driving cars on real estate? One of the dilemmas we have with Uber and car sharing is that traffic has increased. I think that transit is underfunded in South Florida. I’m very excited about the Brightline and the opportunities that it’s going to bring to this community. I think that car dependency is real, especially when we look at how we are connecting our suburbs with the urban core, so we see urbanism in the suburbs—whether it’s Pembroke Pines building a downtown or the town center in Weston. What we want to do is build communities where people can live, work and play and really walk around and be able to bike and have a healthy lifestyle. Walkability is an important component to the communities we are developing. The cost of parking is something we would love to eliminate from our urban developments. What I see in the industry is, planning directors want to reduce the amount of parking. The commercial lending industry still feels it is a need. One trend that you’ll see is how we build our parking garages so that they can be adapted. I think a lot of the design decisions we are making are looking at adaptation on several levels. We are doing a lot of industrial projects, and one of the first things is the logistics industry. As for driverless cars, what would you prefer—a robot driving next to you or an individual who has a bad driving record? There’s a lot of decision-making that goes into these driverless cars. The question for me is, when [are] the safety boards and federal regulators going to accept it? I definitely think that people want to drive less; people want to be in less traffic. There needs to be less urbanism. I think that our prior developers and community leaders created urban developments and suburban communities, so there’s been a trend over the last 15 years of this urbanism, and that comes with challenges. Where are the best schools? Where are the best parks? Where is it safe and secure? I think urbanism is having its growing pains. Are driverless cars the ultimate solution to traffic? We are not going to turn our backs on the suburbs, because that’s where the primary housing stock is. I think creating urban nodes where you have office [and] retail in the suburbs is something I’m excited about. What about technology affecting real estate? I think technology is really disrupting real estate. Instead of us building a 70,000-square-foot Target, we are building a 50,000-square-foot Target. It’s all about efficiency. People in their homes are basically shopping and working. Logistics and storage and how deliveries are made and these types of things—we are looking ahead at [those] things. There’s a lot of real estate tech in the construction industry and in prefab. At the end of the day, people want to be comfortable, and they are typically comfortable with what they know than what they don’t know. I think a lot of this technological innovation is great, but it’s going to take some time for people to get used to it. How do you cope with the cyclical nature of real estate, and where are we in the cycle now? One of my mentors was Tony Goldman. His family is a very close to ours. He created SoHo, Ocean Drive and Wynwood. He passed away a few years ago. He would always tell me, “David, when you think of real estate and you’re making your decisions, you have to think in [terms of] 20 years.” These people who think [in terms of] five years from now, when you financially engineer a deal and you have [a] maturity date looming over you … if you remember what happened in the last housing crisis, what caught everybody was the maturity date and the overleveraging. I think leverage is a drug. It’s something that juices returns, and it’s something that can be irresponsible, too. I think that, after the crisis, a lot of the banks, a lot of the business owners, a lot of the mortgage brokerages and the real estate community saw a lot of reforms. And I think those reforms were healthy for the market. Not only do we want the commercial industry and the development community to really focus on what happens with these cycles, you want to predict three years ahead, when things are going to drop, and make trades and [decisions]. What’s happening right now with the interest rates is obviously a driver that is going to impact evaluations. At the same time, it also brings opportunities. … With these changes in cap rates and from a valuation standpoint, you kind of have to forecast. We had an amazing run over the last decade with low rates that also [have] been a dilemma. After the housing crisis, we saw a lot of cleansing. For me, cycles shift all the time. With the Botaniko project, we thought that contemporary modern architecture hasn’t been done in Weston. We wanted to build something low-density and something that was unique. We are looking at urban industrial areas that are currently renting at $10 a foot. But there’s a lot of adaptive reuse of retail, because owners and residents are looking for authentic experiences. Do you have any plans to get into workforce housing, or any thoughts on how developers might address the affordability issue? There was something called single-room occupancy back in the day. Basically, they have these rooms that cost 30 percent lower in rent. I think the typology of the projects is that affordability is a question. For instance, I have a two-bedroom [unit] that is 1,100 square feet or a two-bedroom that is 700 square feet. What we are seeing is that things are getting smaller. People then are entertaining less in their homes. Their whole family room is the street, it’s the community, is the shopping center. SFBW’s CEO Connect series is an exclusive, invitation-only monthly event that brings together South Florida’s top business leaders to meet and mingle. The sponsors are Celebrity Cruises, FXE, Greenspoon Marder, Sapoznik Insurance, Shorecrest Construction and TD Bank. The evening begins with a cocktail reception for about 100 guests 0followed by the highlight of the event, a live interview conducted by Clayton Idle, SFBW Associate Publisher and a well-known C-level executive who provides insight into their personal lives, careers and views on issues affecting the business community. 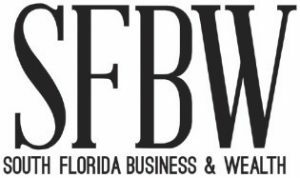 Partnering with SFBW on this exclusive event provides an opportunity to network with the area’s business elite, generate new business opportunities, and increase brand awareness. For information about event sponsorship opportunities, email Clayton Idle at [email protected]g.com. Click here to leave us feedback.